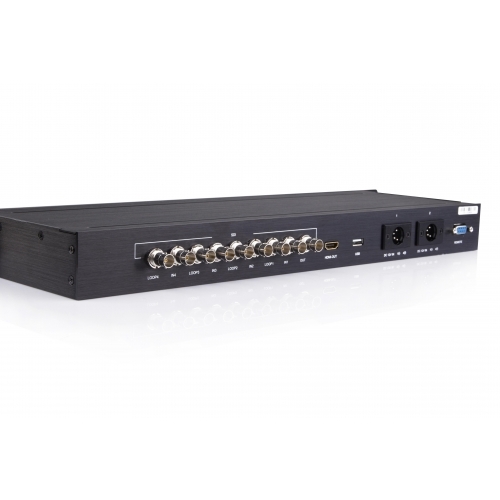 The S-9104+ is the SDI Quad Viewer of 4 SDI input, and output HDMI or SDI in quad split display mode, which is widely used in broadcast studios to monitor 4 SDI signals by 1 HDMI television. 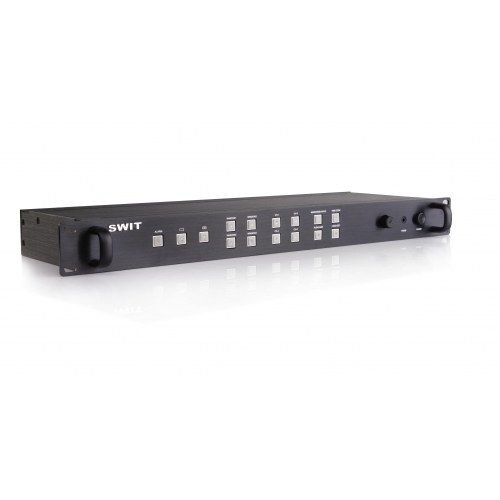 It’s 19-inch 1U designed, and can be installed in standard broadcast racks. S-9104+ adopts the pure FPGA chips to encode the original video; nothing is changed during the input and output with the 10-bit processing, which ensures the color reproduction of the original video. 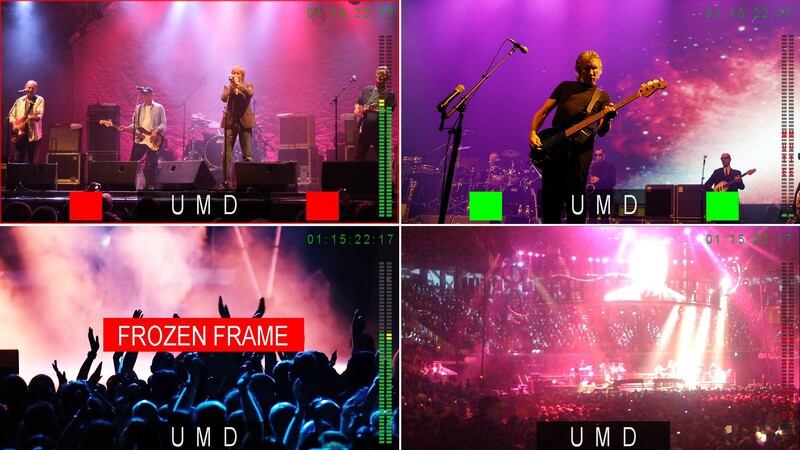 During live video production, the S-9104+ true color reproduction will be perfect for camera technical monitoring. 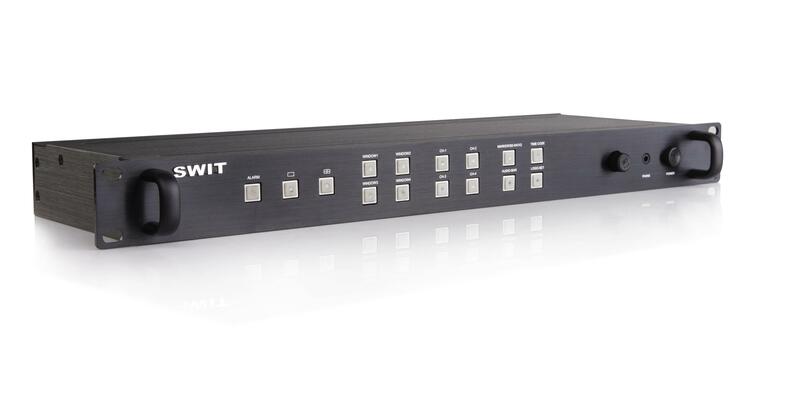 Currently quite a few of broadcast studios produce both HD and SD programs, and S-9104 Quad Viewer supports HD-SDI and SD-SDI mixed input and quad-split output via SDI or HDMI. 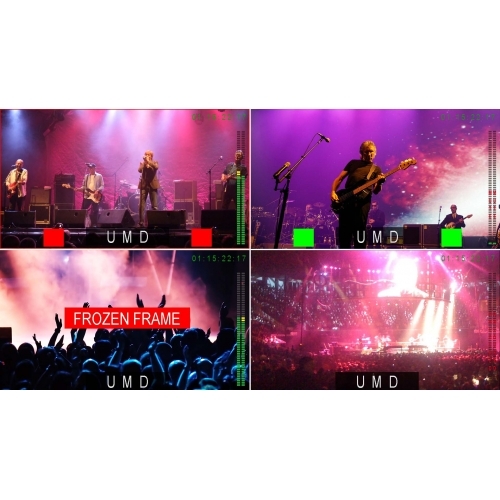 On the Quad-split display mode, you can configure SDI IN1/2/3/4 to be displayed on each of the 4 windows, as well as set each input video to full screen display. All the window configuration can be operated on S-9104+ keyboards, without PC connection. 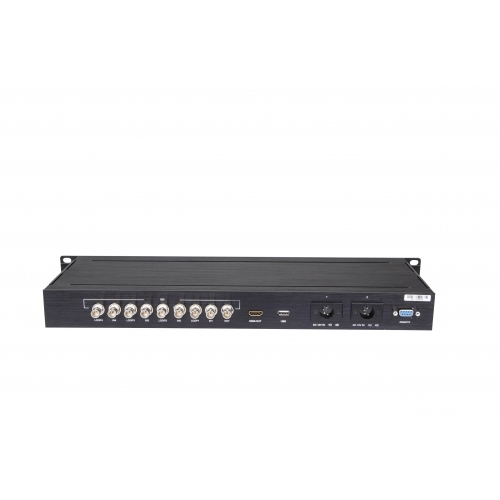 S-9104+ support SDI embedded audio monitoring and timecode display. 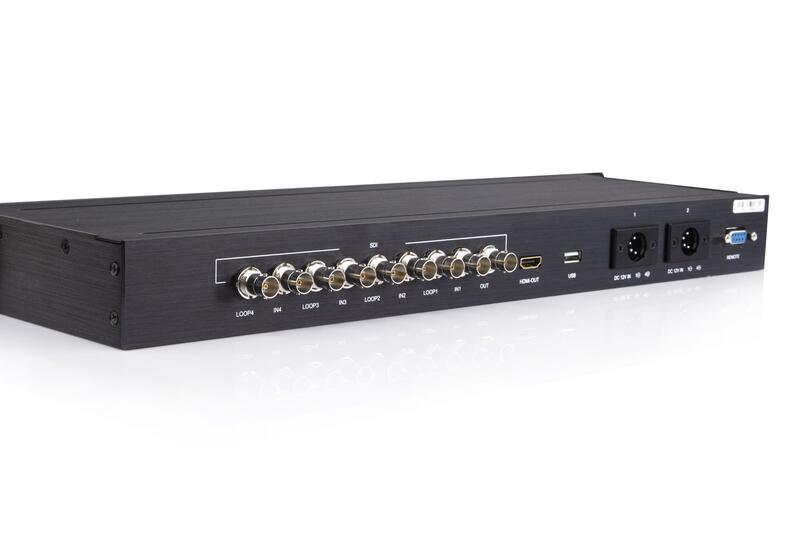 The output video supports 2 channels of SDI embedded audio meters display for each input channel. The audio meter is green, and will turn yellow when exceeds -20dB, and turn red when exceeds -9dB. And you can select the input channel to output SDI embedded audio via 3.5mm headphone socket. S-9104+ supports UMD and Text-TALLY display of TSL 3.1/4.0 protocol. The TSL address is user configurable directly on the S-9104+, without PC connection, and Max UMD length is 8 letters. UMD/TALLY signal input via RS485 port on the S-9104+. S-9104+ provides Video abnormal alerting functions. 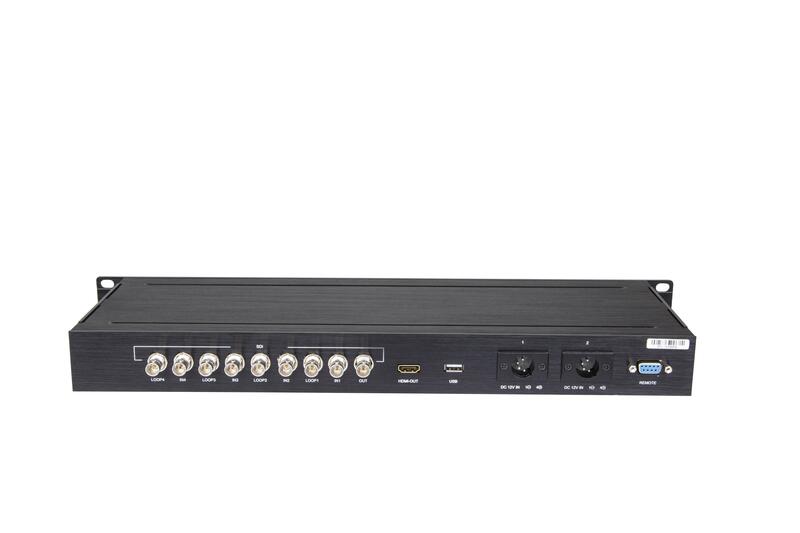 When the input SDI is detected abnormal, including SDI input lost, underexposure or display black, or input video is still, the S-9104+ will display alerting signals on the central of the screen, for studio administrators to check the broadcast system problems. S-9104+ also provides Audio abnormal alerting functions. When the input SDI embedded audio is detected abnormal, including audio lost, audio mute, volume lower than -48dB or higher than -10dB, the S-9104+ will display alerting info on the 2-ch audio meters, for studio administrators to check the broadcast system problems. 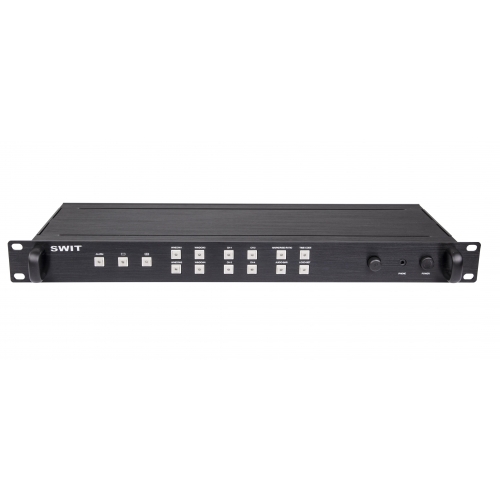 The S-9104+ offers 2x 4-pin XLR DC 12V input sockets on the rear panel, for main and back-up power supply. A 4-pin XLR power adaptor is provided in the product package. The quad-split mode strictly follows quarter HD resolution, with 960×540 of each input video, which could help to get the most of the video definition, remain the original video quality of each input. Meanwhile, if the input video is SD-SDI, it will display pixel to pixel at the quad-split mode. (1) In the quad split mode, support 480i / 1080i60 mixed input and 576i / 1080i50 mixed input. For all the other formats, the quad split mode requires the 4 input SDI of the same formats. (2) If the input signal format is 480i / 576i then the quad split output format is 1080i60 / 1080i50. In other conditions, the input signal format is the same as the output signal format.